Rachel Monroe on the future of public space. Satellite view of Marfa, Texas, and the surrounding area. Map data: Google. What will the future of surveillance in cities look like? In her essay for The Future of Public Space, acclaimed journalist Rachel Monroe suggests that the best place to find an answer might actually be the rural American West. Reflecting on experiences in her adopted home of Marfa, Texas, Monroe reveals the breadth of technological surveillance far beyond the urban center. The Future of Public Space is the second volume of SOM Thinkers, a series of books that poses provocative questions about design and architecture from perspectives outside its professional culture. The mythology of the wide-open West and the “anything” you can do there has been central to America’s self-conception since the colonists first turned their backs on the Atlantic Ocean and confronted the wilderness in front of them, at once compelled and intimidated by the idea of all that land as an open frontier. In his essay “Walking,” Henry David Thoreau admits to feeling the magnetic pull of the West: “The future lies that way to me, and the earth seems more unexhausted and richer on that side.” Tempted by the promise of untapped resources, the frontiersmen set out for the territories, displacing indigenous populations in their quest for presumed riches and a way of living free of bourgeois constraints. Seemingly unlimited space meant seemingly limitless options for fresh starts and self-invention. If things didn’t work out as planned, there was always more West in front of them, more room for reinvention. Until, of course, there wasn’t. These days, only a few decades distant from the days of the unmapped “Wild West,” you can view a remote patch of the Southwest desert via Google Earth, zooming in close enough to see the individual branches on a particular ocotillo. And yet, the idea of the West — particularly the Southwest — as freedom, as openness, persists: “Discover the freedom of the Southwest’s open roads,” the Lonely Planet’s USA Best Trips guide promises. The sweeping vistas of the American West continue to inspire this land is your land, this land is my land feelings, and for good reason: in the 11 westernmost states, the federal government owns nearly half of all the land, most of which is open for public use; only about 4% of the rest of the United States is designated as public land. I myself was seduced by the Lonely Planet version of the West. Five years ago I drove across the country by myself in a Volvo sedan I was convinced would make it to 300,000 miles, pointed toward California and daydreaming of palm trees. I remember the afternoon I drove through West Texas, that evening’s slow and gaudy show of a sunset, pink and gold smeared across the wide horizon. I could drive fast out here, and there were long stretches with no other cars on the road. Space. Freedom. I had never realized just how watched I felt in the cities of the East Coast, where I’d spent most of my life, how hemmed in by their pure human density. Something about being the only car on the long ribbon of road beneath that wide expanse of sky made me feel suddenly and distinctly American. And that Americanness was somehow tied to this public kind of privacy, the sense of being outside and alone and unwatched. 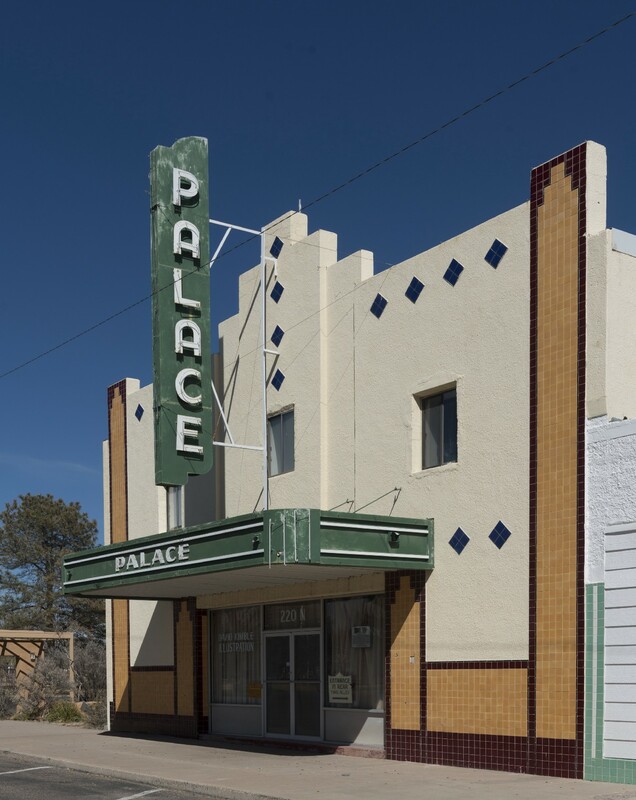 The Art Deco Palace Theater, a onetime cinema in downtown Marfa, Texas. Photo by Carol M. Highsmith, from the Lyda Hill Texas Collection of Photographs in Carol M. Highsmith’s America Project, Library of Congress, Prints and Photographs Division. I scrapped California in favor of moving to Marfa, Texas. It took only a couple days in my new home before I began to realize that my mythology was misguided, or at least naive. The small high desert town was surrounded by vistas that looked like the backdrop for a Hollywood Western — both There Will Be Blood and No Country for Old Men were filmed there the year before — but I started to suspect that the landscape’s aesthetic connotations of freedom didn’t necessarily mean I was any more free, and that the absence of crowds didn’t mean that I was any less observed. I had to quickly adjust my expectations when people I was meeting for the first time seemed to know all about me. I’ve seen your Volvo around, they’d tell me. But how did they know? I learned that they all reflexively kept tabs on each other: who had just returned from a trip out of state, who was parked outside whose house, and who drove what. A friend who’d lived in Marfa his whole life told me about how when he was in high school, he and his friends would cruise the farm roads after Friday night football games; there were so few of them that they could recognize one another a quarter mile away by the distinctive shapes of their headlights. I started to sense that I was being watched whenever I left my house. There were no anonymous spaces, no ways to be in public without being subject to (a mostly benevolent and low-key) surveillance. The feeling wasn’t entirely unpleasant — I’d place it somewhere between cozy and claustrophobic — and it was a welcome change from my urban conditioning of always being in a crowd, seen yet unnoticed. But it was also unsettling. That first month, my unease revealed itself in dreams. I had my first social surveillance nightmare, in which I was perpetually running from sinister government agents in bespoke suits. Whenever I escaped to a new location, they’d see my car parked outside and come after me. Debates about the use of public space usually presume an urban context and center on a city’s plazas and parks, places that have historically accommodated many uses by many types of people. These kinds of public spaces are where disparate populations intersect, where “the stranger feels at home,” according to urban sociologist Ray Oldenberg. These qualities of openness and mutability are rarely accepted without conditions — hence the long, entwined history of public space, surveillance, anonymity, and policing. In English Common Law, the basis for the legal code of the United States, the earliest forms of policing public space came in the form of vagrancy laws — a vagrant being by formal definition a person who was unable to give an account of himself. These days, one of the most pressing questions regarding the use of public space centers on the role of surveillance, and whether the potential gains in increased security are worth the trade-offs — lost privacy and increased power ceded to police and other authorities. One thing about security cameras is that they tend to announce themselves, often manifesting just above our heads as ominous, silver-black orbs or disc-like convex mirrors. But not all surveillance is quite so visible. 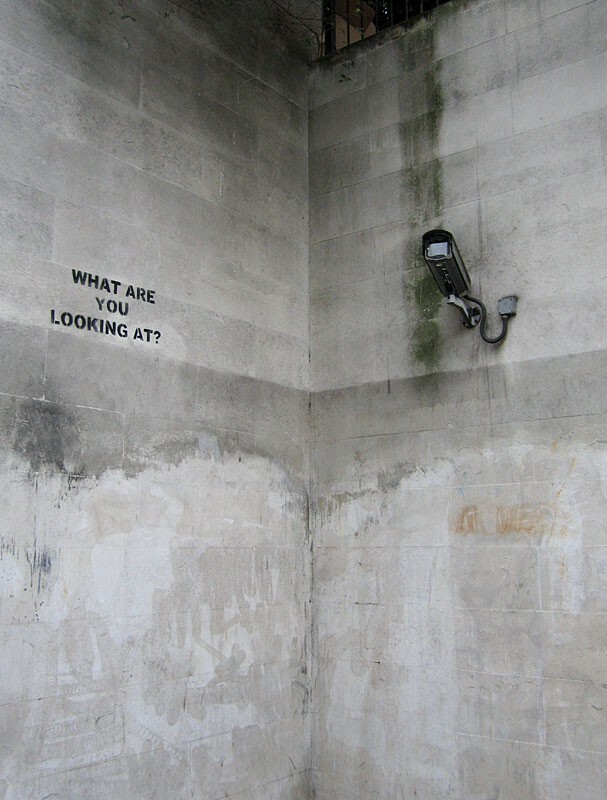 Graffiti commenting on the neighboring surveillance camera in a concrete subway underpass near Hyde Park in London. Photo by Andrew Dunn, CC BY 2.0. Over recent decades, advances in technology have led to more sophisticated — and increasingly normalized — forms of surveillance. The daily movements of Londoners are captured by an estimated half a million security cameras, one for every 14 people, and other cities have followed suit in investing in CCTV systems. Dragnet surveillance — that is, blanket information collection — is becoming a standard practice in many urban areas, where large proportions of the public often approve the use of heightened surveillance. Shortly after the Boston Marathon bombings, a national survey showed that only one in five Americans opposed the use of security cameras in public places. The prevailing theory is that public places require certain levels of policing and monitoring to keep them safe, to prevent the small percentage of criminals from damaging the experience of the majority. Of course, the actual implementation of surveillance is complicated and fraught with political connotations. But many accept the panoptic logic that covering cities with CCTV cameras can effectively reduce crime, holding fast to the belief that bad actors are less likely to act badly if they recognize that they’re being watched. One thing about security cameras is that they tend to announce themselves, often manifesting just above our heads as ominous, silver-black orbs or disc-like convex mirrors. But not all surveillance is quite so visible. In 2014, The Washington Post reported that the U.S. Army would be installing two tethered surveillance blimps on a patch of military-owned land between Washington D.C. and Baltimore; the aerostats, as they’re called, are equipped with radars capable of tracking as far south as Raleigh, North Carolina, and as far north as Boston. The aerostats’ ostensible purpose is to watch for cruise missiles or enemy aircraft entering domestic airspace, but the Army has refused to rule out equipping them with the kind of high-altitude surveillance systems or infrared sensors that can be used to track individual people and cars, even from an altitude of 10,000 feet. The Army also claimed “no current plans” to share the information its aerostats collected with law enforcement — which is perhaps why some local governments have begun looking into investing in persistent surveillance systems of their own. In the summer of 2016, citizens of Baltimore (and even the city’s mayor) were surprised to learn that for the past eight months, a Cessna equipped with an array of cutting-edge cameras had been flying over the city for up to 10 hours a day, capturing detailed footage of everything taking place in a 30-square-mile area. 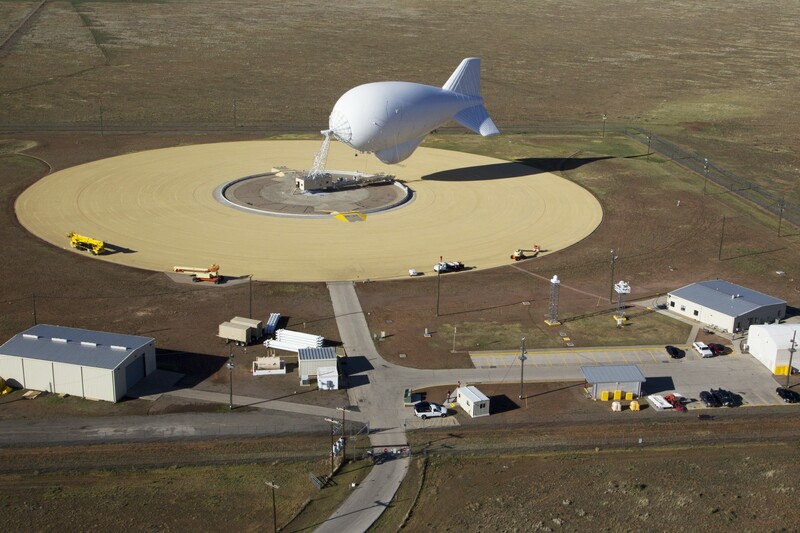 The Tethered Aerostat Radar System (TARS) in Marfa, Texas. Photo by Donna Burton, taken for U.S. Customs and Border Protection. When the news of Baltimore’s secret surveillance planes surfaced, I was troubled but not shocked. I suppose that by now I’ve been conditioned to expect that when I’m in a city, I’m being watched. What has surprised me, however, was coming to realize how much surveillance was a part of my daily life in the rural Southwest. Years before Baltimore’s secret surveillance plane took its first flight over the city, predator drones flew over Arizona’s Sonoran Desert, equipped with video and motion capture technology. And every time I drove west out of Marfa, I passed by an aerostat just like the ones recently installed on the East Coast. Our local surveillance blimp has been in place since 1989, and is managed by the U.S. Customs and Border Patrol (CBP). On bad-weather days it’s grounded and sits outside its hangar; other times the CBP lets it out on its tether and it hovers in the sky, a small speck visible from miles away that sabotages my sunset photos. Is that an art installation? more than one tourist has asked me. I can understand the question; up close, the aerostat looks so benign, cuddly almost, like an orphaned float from a Thanksgiving Day parade. But it is more substantial than it appears; the high-tech zeppelin and its seven counterparts positioned along the U.S./Mexico border are equipped with radars weighing more than a ton, capable of detecting low-flying aircraft within a 200-mile range. There are other, smaller aerostats keeping tabs on ground traffic in the border region, too, the people and vehicles moving through the area — technological veterans of the wars in Iraq and Afghanistan, complete with bullet holes. Rural border surveillance also takes advantage of other cutting edge technologies, as well as social trends like crowd-sourcing and gamification. In fact, much of the surveillance equipment used by CBP along the border are military hand-me-downs, or adaptations of technology originally intended for use in the Middle East. As resources (and funding) begin to shift away from wars in Iraq and Afghanistan, defense contractors began to consider how to make money closer to home, Todd Miller explains in Border Patrol Nation: Dispatches from the Front Lines of Homeland Security. “We are bringing the battlefield to the border,” Drew Dodds told Miller. Dodds, a former Marine, is now a salesman hawking a mobile surveillance system called Freedom On-the-Move, essentially a truck bed featuring a periscoped camera that can be maneuvered by an Xbox controller, and which provides “spot and stalk” technology to track migrants moving across the borderlands. Such technologies are also making their way to urban police departments, too. And so if you want to understand the future of what surveillance of urban spaces might look like, the best place to look might actually be the rural Southwest. A screenshot of RedServant’s user interface, taken by artist Joanna Moll. Rural border surveillance also takes advantage of other cutting edge technologies, as well as social trends like crowd-sourcing and gamification. From 2008 to 2013, the state of Texas funded an innovative program centering on participatory surveillance of rural border areas. It was meant to address a particularly contemporary problem: an abundance of cameras and a dearth of people to monitor them. RedServant, a technology start-up based in a small town 200 miles east of where I live (and whose name sounds like a militia dreamed up by PlayStation), enlisted civilian volunteers — referred to as “virtual police officers” — and provided them with free, 24/7 access to the more than 200 video feeds and sensors installed along the border with Mexico. When users saw something suspicious, they could click a red button to alert the local sheriff’s department, which would go investigate. RedServant’s interface was designed to make surveillance seem like a game, similar to military training technologies modeled after video games. Users could choose between a number of real-time surveillance cameras, each “virtual stake out” with its own objective: Look for individuals on foot carrying backpacks. Please report persons on foot and vehicles that are parked along road.
. . . the free and open West, the rough terrain that symbolizes rugged individualism and American self-invention, may actually be the most closely watched territory per capita in the country. And so surveillance technologies follow an established path, from the battlefield to the border to the city. And the free and open West, the rough terrain that symbolizes rugged individualism and American self-invention, may actually be the most closely watched territory per capita in the country. Photo by Jonathan McIntosh, CC BY 2.0. Midway through my road trip five years ago, I was zipping through the high desert just past the line that marks the shift from Central to Mountain Time, where the land does indeed start to become steeper and craggier. Even though I was on Interstate 10, a major national highway, the road was still empty enough that I could let my mind wander. And then, seemingly in the middle of nowhere, a confusion of lights and orange cones: my first border patrol checkpoint. It caught me off guard then, but I soon learned that in 1976 the U.S. Supreme Court authorized random-stop checkpoints within 100 miles of the U.S./Mexico border. After five years of road trip interruptions, the checkpoint routine has become familiar to me, though still always tinged with anxiety. Cars heading south or west can generally zoom on through the checkpoint, although a camera will record their license plate numbers; those heading north or east, though, have to stop. The procedure follows a predictable pattern: while a German Shepherd sniffs your hubcaps, a young man in a uniform begins asking questions: Are you a U.S. citizen? Everyone says that’s the only question you’re legally required to answer, but the checkpoint agents often seem bored and eager for conversation: Where have you been? Where are you going? Do you live in Marfa? Do you like it there? I fantasize about replying with stony silence, but a certain submissiveness inevitably bubbles up when I’m faced with authority, and I always answer, despite myself. Just heading home, I say. Yes, it’s an interesting place to live. People who don’t spend much time in the Southwest are often surprised by these checkpoints. They probably think, as I did when I first moved here, that border patrol checkpoints are something that exist at the border, and that the border is a line between two countries, and that it is easy to tell which side you are on. The checkpoints complicate the Great American Myth of the free and open road. (“The mixed blessing of America is that anyone with a car can go anywhere,” Paul Theroux wrote in his 2009 account, “Taking the Great American Road Trip,” concluding that “the visible expression of our freedom is that we are a country without roadblocks.”) But as the checkpoints make clear, the border is increasingly a zone, not a line — or perhaps even a mentality, a net of assumption and suspicions. 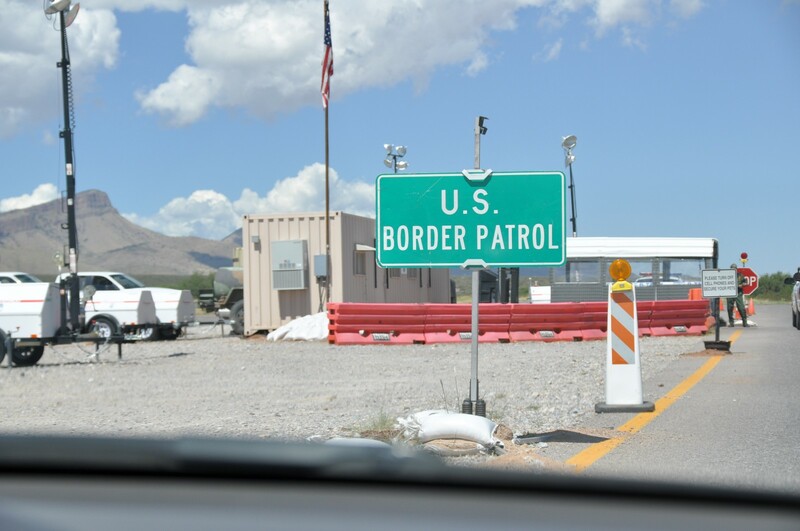 And so the people driving on the public roads and highways of the Southwest are subject to heightened scrutiny, and the border patrol checkpoint is becoming just as much a part of the American road trip as gas station coffee and tumbleweeds. In the borderzone, you should be prepared to give an account of yourself. And, as Miller notes, the borderzone is always expanding. Clearly, this stylized, road-trip West is an invention. Like it or not, we live in an era of mass data collection, new surveillance technologies, and expanded police powers, an era when social media allows us to obsessively keep tabs on ourselves and others. Yet we also continue to contend with a centuries-long daydream that imagines the American West as the territory for all our escapist fantasies. Just as the European colonists chased visions of resource-rich, rule-free, inexhaustible land, some contemporary city dwellers see the West as a place to stock their Instagram feeds with images of canyons, cacti, and other symbols of freedom and exploration. Ironically, this enduring belief in the mythology of the West — and the disregard for its surveilled reality — threatens to undermine the very freedom that many ostensibly valorize. We need to watch back. This all may sound bleak, but it doesn’t have to be. 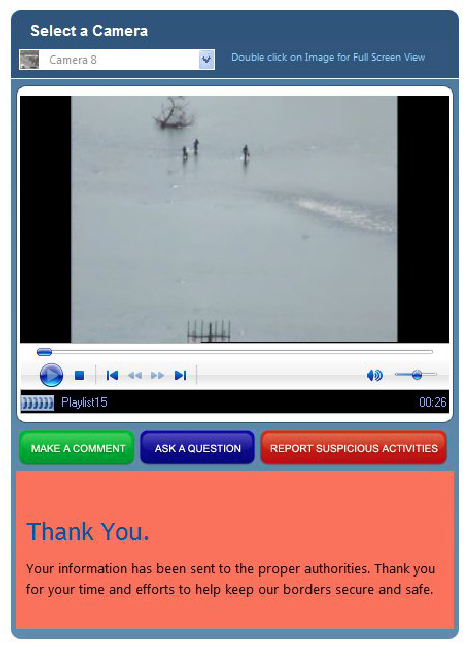 While at first I found the social surveillance of my small Western town to be unsettling, I’ve grown to appreciate it. We return each other’s lost dogs; we notice when someone is struggling. The difference, of course, is that we are all in it together — we’re watching each other watching each other, a circular system that provides for a level of mutual accountability. It’s clear that surveillance on the part of the government, the military, or corporations is a different animal. What’s also becoming clear is that we have every right to demand similar structures of accountability in these situations, too. The checkpoints and surveillance blimps are there. Rather than cropping them out of our mental pictures (or gleefully aestheticizing them as art), we need to keep an eye out for them. We need to watch back. That means paying attention to what is being authorized, how it’s operating, who’s paying for it. In looking closely rather than looking away, we can begin to create a culture of accountability, rather than one of denial. This will likely require letting go of cherished notions of the West as a place where we can live freely, where we can “do anything.” Those wide-open spaces may have once looked like freedom, but they arguably never really were. In today’s technological landscape, these spaces provide the best sightlines: when there are so few people around, it’s easier to zoom in. This essay was written for the The Future of Public Space, the second edition of SOM Thinkers. Each book in the series brings together leading voices on a single topic related to the built environment. 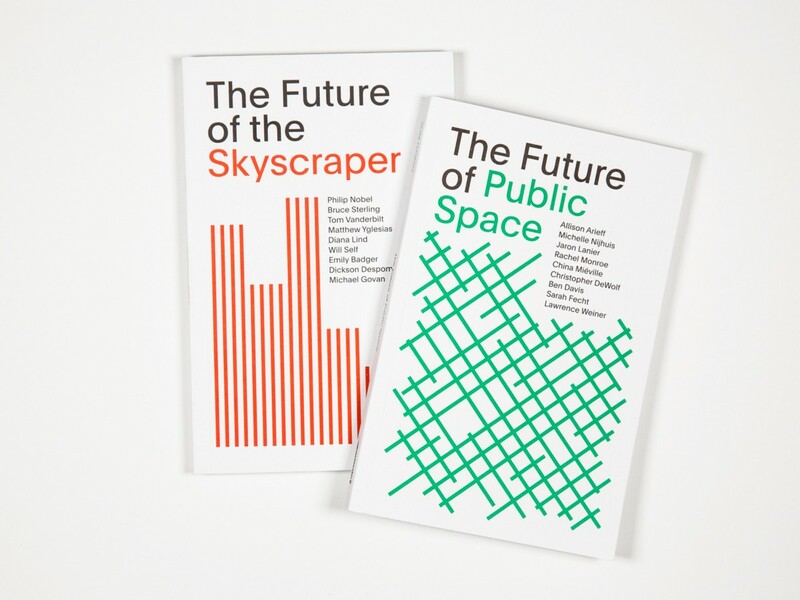 The Future of Public Space explores how different types of public space — urban and rural, real and virtual — influence everyday experiences in an increasingly privatized world. The book is available for purchase. Freelance writer, volunteer firefighter, and occasional radio host Rachel Monroe is based in Marfa, Texas, where she writes about crime, books, border issues, and utopian experiments. She’s written for the New Yorker, New York magazine, the Oxford American, Texas Monthly, the Guardian, and Bookforum, among others. She was selected as one of the female journalists everyone should read by New York, was a finalist for The Livingston Award for Young Journalists, and featured on Longform’s list of the top ten pieces of 2014. Her new book, A Life in Crimes, will be published by Scribner in 2019.